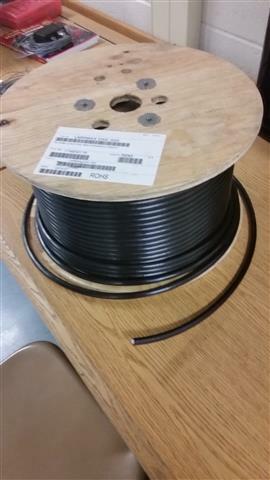 We were desperate for feed lines and patch cords, so we ordered a 500ft spool of coax and made our own. The club needed some coax patch cords and feed lines for our antennas. We have been relying on our friends at K8TKA (20Over9) for these things, but it was time that the club started building their own inventory. The best way to do this (and the most cost effective) was to get the cable and make our own. We ordered a 500ft spool of coax, the ends, and a new crimp tool kit. We got all of the cable cut to length and put on the ends, then onto the fun part, soldiering. The club now has enough cabling to get through the rest of the year and hopefully a few more years as well.